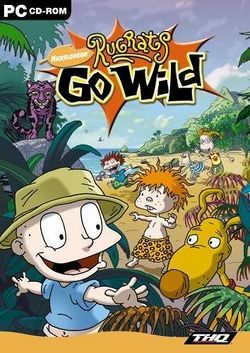 Rugrats Go Wild is a platform game, that was released by THQ for the Microsoft Windows operating system and the Game Boy Advance, on May 28, 2003; as the name suggests, it is the fifteenth title in the Rugrats series, and like the film it's based on, it features characters from Klasky-Csupo Inc's third Nickelodeon cartoon, The Wild Thornberries (Eliza Thornberry, Donny the jungle boy, and Darwin the monkey). This was Klasky-Csupo Inc's second crossover in the Rugrats universe as a 1999 segment of the show, "Ghost Story", guest-starred the three main characters of their second cartoon, Aaahh!!! Real Monsters - and Chuckie's actor, Christine Cavanaugh (1963-2014), reprised the voice of Oblina.